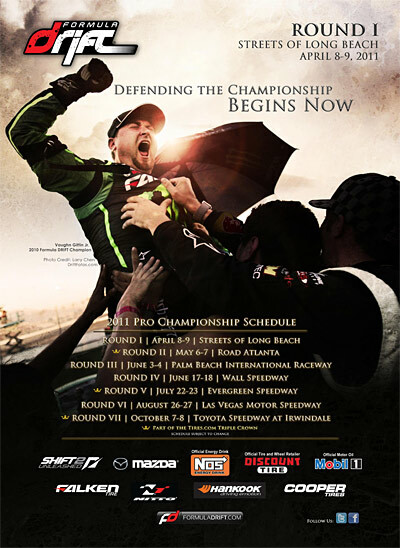 Long Beach, Calif. – November 4, 2015 – Formula DRIFT has announced the 2016 schedule of events. The schedule includes World Championship, Pro Championship, and PRO 2 events. 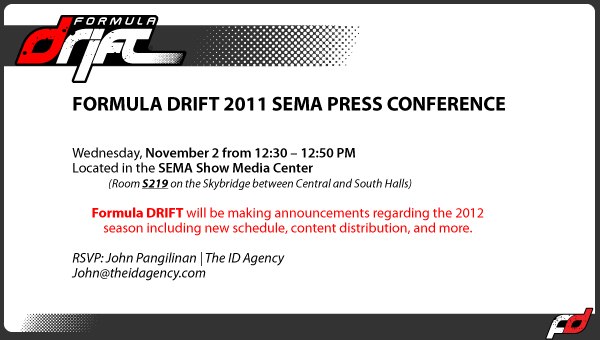 In addition, both Formula DRIFT Japan and the inaugural Formula DRIFT Canada will have their own respective four event schedules. Entering the thirteenth year of competition, Formula DRIFT will expand the Pro Championship to eight rounds of competition by including the Montreal round. This is the first event outside of the United States to be included in the Pro Championship in the history of the Series. The World Championship will consist of eight Pro Championship rounds and two Japan rounds of competition. The PRO 2 Series will consist of four rounds of competition with a new stand-alone PRO 2 and Pro Am event announced on September 30 –October 1 in Phoenix, Arizona. In 2016, the Pro Series will continue to be broadcasted on CBS Sports and distributed globally by IMG Media with a reach of 360 million homes. Formula DRIFT Japan will be broadcasted on JSports. Each of the Series will be live streamed globally and was viewed by over 2 million people internationally in 2015. For more information on Formula DRIFT Canada and Formula DRIFT Japan please visit: www.formuladriftcanada.com andwww.formulad.jp.